Performer intakes are part of the Edelbrock power package. The Performer package is designed to greatly increase performance and driveability in the low to mid-rpm range. This is the first level of increase over stock. The Performer package parts available include intake manifold, camshaft, carburettor and cylinder heads. This intake can be used in conjunction with other mild camshafts. The Performer intake is a good choice for otherwise stock or mild performance engines as power is produced from idle to 5500 rpm. Designed for street 1955-86 262-400 cubic inch small-block Chevrolet V8. 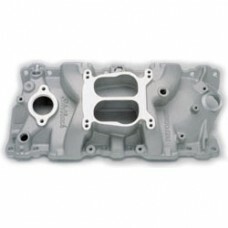 Will accept OEM 4-bbl or Edelbrock Performer series carb. Will not fit 1987 and later Chevrolet cast iron heads – will fit Edelbrock and other 1987 and later aluminium heads. Recommended carb EDEL1404 or EDEL1405 for most mild applications. Manifold height A-3.50”, B-4.60”. Use intake bolt set EDEL8504. This item is now special order only. For an alternative use Edelbrock 2701 intake.